LOCAL AUTHORITY RECORDS reveal what has been described as daily abuse experienced by traffic wardens across the country. 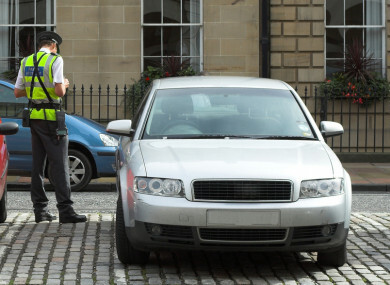 Wardens are employed either directly or through another company by local authorities to enforce parking rules and traffic regulations and can issue fines to drivers. Details provided to TheJournal.ie following a number of Freedom of Information requests highlight the hostility shown by some drivers towards wardens who have issued tickets to them. From January to August this year, the local authority with the highest number of incidents on record was Meath County Council. The council said there were 20 incidents in Navan, including a number of serious threats and physical altercations. In one incident, a warden at Kennedy Place in June observed three cars parked in clearway. He asked the drivers to move on and they refused. The warden said he would issue a fine and that the drivers responded by “laughing and making fun of him”. He then issued a fine. As he was putting it on the windscreen the “driver drove off and as he was driving he grabbed traffic warden’s shirt”. The warden managed to pull free, but the council said the driver “then got out of the car and punched [the] traffic warden in the head”. In March, a comment was posted on Facebook about a warden which stated: “Follow him home and burn him out”. Meath County Council said this was “reported to gardaí who said the law does not cover Facebook”. Gardaí advised the warden to report the comment to Facebook. Siptu organiser Brendan O’Brien expressed concern at this particular incident which he described as “incitement to violence”. “We can’t have a situation where social media outlets are allowed to be a free-for-all. Who’s to say someone is not going to read it, take a rush to their head and act on it?” he said. He said the response to this incident was “frankly not acceptable” and called on the government to legislate to cover this kind of abuse or intimidation on social media sites. A taxi driver on Kennedy Road in July was “very rude and aggressive and shouted at [the] traffic warden”. According to the council’s report, the driver said “he would make his job hell and he would break his legs if he saw him near his car again”. The incident was reported to gardaí. A fine was issued on Fairgreen Road in March for parking on a double yellow line. The owner became verbally abusive as the warden had issued a fine for tax the previous day. He told the warden that if he came his way the next day he would “put his head through the windscreen”. The incident was reported to gardaí. The warden issued a ticket to a vehicle which was parked on double yellow lines. The owner shouted abuse at the warden and when he was passing by in the car rolled down the window and said he would come back with his brothers and “bust [the] traffic warden’s nose”. This was reported to gardaí. While the traffic warden was taking photos of a car parked on double yellow lines, a car drove past and someone inside “threw a bread roll at him”. A fine was issued for parking in the central median on Kennedy Place. The owner became verbally abusive. As the warden was leaving the area, the owner passed in the car and “gestured to him with his hand”. Dun Laoghaire Rathdown County Council employs DLR Parking Services to administer parking enforcement. According to the company, there were five reported incidents in the first seven months of this year. Three of these involved verbal abuse or threatening behaviour. In one incident in April on Kill Avenue Dun Laoghaire, DLR Parking Services said the warden sustained an injury. The company also said there are many incidents of verbal or threatening behaviour of wardens “on a daily basis”. Cork City Council said there were four reported incidents so far this year. Two were in February. On 2 February on Farranlea Road, one warden reported verbal abuse and threats of physical assault by the driver of a vehicle following the issue of a ticket. On 21 February on Cathedral Road, another warden reported the handheld computer unit was knocked from their hand following the issue of two tickets. During an incident on South Main Street in June, a warden reported “threats of assault and sustained verbal abuse following issue of ticket”. In Tipperary, there were nine reported incidents between January and August this year, including one in Carrick-on-Suir in which a warden had their own vehicle vandalised. In another altercation in Nenagh on 16 March, the warden asked the driver to remove their vehicle from double yellow lines. Verbal and threatening behaviour towards a traffic warden while he was issuing a parking fine. Incident reported to guards and to the traffic warden’s line manager who subsequently reported this matter to health and safety section. This person approached the traffic warden about one hour later and apologised for their behaviour – apology accepted and no further action taken. Cork County Council had one reported incident during that period, in Dunmanway on 8 June. The warden reported “intimidating behaviour” and said they were “knocked off balance”. Mayo County Council has just two reports of altercations involving traffic wardens, including one in Claremorris on 17 July in which “threatening gestures” were made. In Donegal, there were two reported incidents of wardens being verbally abused or threatened – the first in February in the Courtyard Shopping Centre in Letterkenny and the second on East Main Street in Bundoran in May. Kerry County Council had four incidents of verbal abuse towards traffic wardens over the seven-month period. In Monaghan between 2010 and 2016, there has only been one formal complaint (2014). The types of incidents the wardens tend to complain about include vehicles failing to stop and verbal abuse towards the wardens. Roscommon County Council said there no reports of these types of incidents in the first seven months of this year. Siptu’s Brendan O’Brien told TheJournal.ie that the number of these types of incidents over the last two years has risen “both in terms of verbal and physical assaults”. “There are a number of counties where it’s gotten so bad that members are now required to wear body cams like you see on rugby referees in case anything happens, so there is a record of it. It’s getting to that and clearly that’s unacceptable. From our point of view in the union, there needs to be a number of things done. Clearly this needs to be recognised by employers for the serious issue it is and they need to take whatever further protective measures are required. So there is the question of lone working – the majority of them work on their own and there is little protection. “There also needs to be greater deterrents in the legal system, stiffer penalties for anyone found to be engaging in threatening behaviour or impeding members discharging their duties. Email “'Follow him home and burn him out': Records reveal abuse and assaults suffered by traffic wardens”. Feedback on “'Follow him home and burn him out': Records reveal abuse and assaults suffered by traffic wardens”.